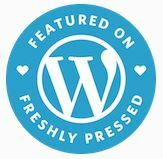 Don’t Do Number 2 During World War Z | "Granny Beads and Grocery Store Feet"
Very good book that is NOT transferred to the big screen totally. World War Z is a suspenseful action movie pitting Brad Pitt as a smart ex-UN operative against a planet killing zombie apocalypse. Oh, and these aren’t your parents’ shuffling, slow, and dim-witted undead. These are leaner, meaner, and — most frightening — faster zombies who “turn” within seconds of being “infected,” run in groups, which turn in to packs, which grow in to hordes, which are basically city-spanning swirling fuzzballs of toothy, decaying death drawn to anything living and seemingly tasked with ONE major function — eating people’s faces off. Now, let me tell you what happened to me when I saw World War Z yesterday afternoon. Budge and I went to see WWZ with Deuce, Cam, and Jake after a big Mexican meal at El Tejanos. Three fourths into the movie, the salsa and nacho cheese demanded my immediate attention. So, I did the “Cornholio walk” from theater 13 to the opposite end of the multiplex where the little boy’s room resides at The Simpsonville Regal 14. Sitting pondering the lack of interesting graffiti to read, I suddenly noticed the silence. JUST like in the movie before a zombie ate someone’s face off. I found the stillness unnerving. Anyone acquainted with me can tell I am extremely high-strung and jumpy. I make coffee nervous. Put me on a bomb squad; we all die. Mama used to wake me by throwing things at me to avoid my blind flailing. 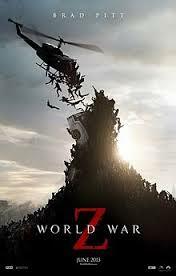 If I hadn’t been so enamored with the World War Z novel, I wouldn’t even be in the same building as a zombie flick. I don’t do suspense or horror movies. They tear my stomach up, and my fits are dangerous to bystanders. Also very good, but in another way entirely. I sat freaking myself out when I heard the water slowly dripping. JUST like in the movie before a zombie ate someone’s face off. Now I shift into turbo-hypermatic nervous mode. I managed to finish the business at hand, rearranged my attire and headed for the door, BUT like a good little boy, I stopped to wash my hands because you never know if something from the toilet will mutate into a pathogen which will spark the zombie apocalypse. So I’m trying to wash my hands, but they are shaking so badly the water kept missing them. Finally, les mains passably clean, I looked up at which point shtuff got real! A wall to wall mirror adorns the wall in front of the sinks in the men’s room of the Regal. Now, I’m already on uber hair-trigger when I glance up and this random guy just APPEARS in the doorway. JUST like in the movie before a zombie ate someone’s face off. One second I’m in a terrified state trying my darndest to get clean and get out; the next, I’m face to face with someone about to eat my face off. I like to think of myself as a warrior. I have guns. I’ve shot at people . . . in video games, but still. I believe I’ll be a man of action if the proverbial “S” ever “HTF.” Since I carry myself like such a badass at all times, I whirled to face this threat and — just as ancient martial arts texts teach — screamed like an eleven year old girl at a One Direction concert. I caught myself before hurling the only weapon I had — my Galaxy S3 — at dude’s head. Incidents like this are one reason Budge is foursquare against me ever getting my concealed carry permit. I think the poor guy soiled himself. I pulled myself together sufficiently for a quick “bro-ish” nod before squeaking, “World War Z, Man. Zombies. Thought you were going to eat my face off.” He treated me like we teach children to treat people driving nondescript white vans and offering free candy to “just come inside.” Fully deserving “The Cone of Shame,” I stumbled out of the men’s room and back to my seat just in time for the last of the movie with my face (if not my dignity) intact. On the plus side, I can still go to that movie theater. I loved the book, and I really enjoyed the movie — at least what I saw through the fingers I was constantly throwing in front of my face whenever someone was about to get his face eaten off. If you’ve read the book, you do need to understand one important thing: they DID NOT bring the book to life on the big screen. 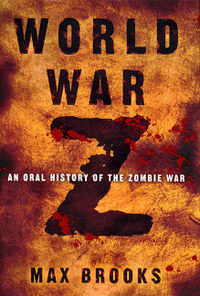 The book is a well done faux non-fictional account of “The Zombie War” told in a series of interviews with various survivors. The MOVIE is about what was going on BEFORE anyone had time to worry about interviews because they were too occupied with keeping their faces from being eaten off. This is one instance of a book appearing on film where I really feel no comparison for good or bad need be made. Each is an enjoyable escapism fodder in its own right. If you read Pat Conroy’s The Prince of Tides then saw the Nick Nolte and Barbara Streisand movie made from the book, you’ll know what I’m talking about. The bottom line is, if you liked the book, the movie is different but enjoyable fun; just don’t go looking to see an exact transfer from one medium to another. Besides, if you stop to think about it, a movie of a guy doing interview after interview would eventually get boring. I liked the movie and I typically avoid any HINT of “horror” like a tax audit. Great review. Impressive and fun, but not as a good as it’s first 20 minutes promised.